In an X-ray tube, an incandescent filament heated to a very high temperature generates free electrons. These are accelerated to a high speed by an electric field before colliding with our anodes. The resulting rapid deceleration causes the electrons to release their kinetic energy in the form of heat and X-ray radiation. We manufacture durable stationary anodes for x-ray technology from copper. 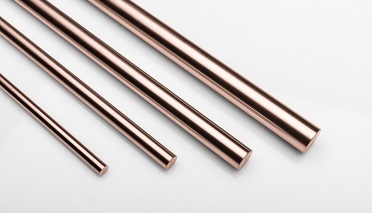 For the X-ray devices used in the dental care field, we supply copper back-cast stationary anodes manufactured from tungsten, potassium-doped tungsten (WVM) or tungsten-rhenium. The perfect bonding of the tungsten and copper ensures excellent heat dissipation and guarantees the outstanding durability of our components. Shielding heads made from copper, tungsten-copper or the tungsten heavy alloy DENSIMET® prevent the scattering of the X-ray radiation. We are able to supply ready-to-mount stationary anodes with integrated or detached shielding heads.